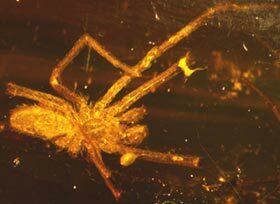 A spider trapped in amber for twenty million years has been found by paleontologists; for the first time, traces of blood have been found in an amber fossil. Paleontologist David Penney says says it may be possible to extract DNA from the extinct spider's blood. The specimen came from an amber mine in the Dominican Republic on the Caribbean island of Hispaniola. 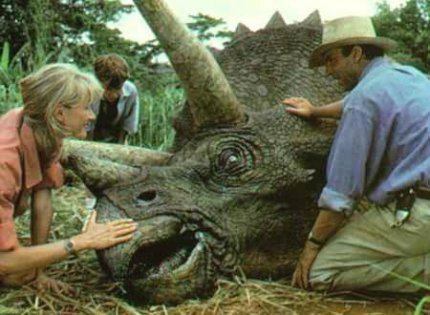 As science fiction fans know, Michael Crichton popularized the idea that dinosaurs could be brought back to life in his novel Jurassic Park. In the novel (and the movie), DNA from blood collected from mosquitoes encased in amber was used to resurrect T. rex and velociraptor, among others. Penney believes that it may be possible to extract DNA from the spider's blood; however, the likelihood of dinosaurs making a twenty-first century comeback remain remote. Take a look at Pleistocene Park' For Woolly Mammoths? for a real-life plan to bring mammoths back. See also Spider's Blood Found in Amber.